There is a cairn atop Knockacarna hill (Cnoc na carna, trans. Hill of the cairn), from which it gets its name, in the townland of Raha (An Rátha, trans. 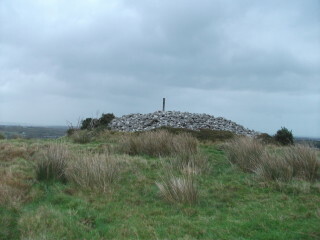 the ringfort), which is more than just “an auld heap of stones” for this cairn is known locally as King Raha’s Grave. The mound has a prominent location and is visible from a great distance and is reputed as the resting place of a local chieftain or king who ruled over the area in the distant past. Cairns are essentially man-made piles of stones which are most often used in Ireland as site-markers. These sites can range from the mere summit of a hill to an important burial site. This cairn is most likely a Neolithic or Bronze Age burial monument, one of a small group of such which dot the hilltops along the western side of Lough Corrib. 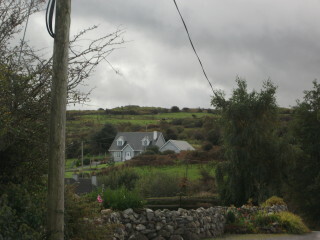 Similar sites can be found close by dotting the twin peaks of Clooshgereen hill near Rusheeny where another cairn and a ritual site with a holy stone occur. Unfortunately, this particular cairn has yet to be excavated and hence it hasn’t been determined whether there is any truth behind the folklore. However, there is an old saying “Cuirfidh mé cloch ar do chairn” (I will put a stone on your cairn) which gives some insight into burial customs in Ireland. It was tradition for those who knew, liked, loved or respected the deceased to place a stone on the grave hence the larger the cairn, the greater amount of stones and the more prominent the location: the more powerful and revered the deceased. 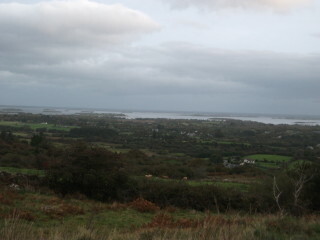 This monument’s dominating siting with panaramic views over Lough Corrib, Lough Buffy and the Connemara mountains as well as its considerable size (18.75 diameter, 12.15 height) add weight to the folk beliefs. Although the name King Raha is illogical given its prehistoric date and the lack of both kingship and ringforts (rátha) in Ireland at that time; i believe that whatever their name may have been a great person still rests atop the hill of Knockacarna. This page was added on 27/08/2012. I have sent you an email in relation to this. Hello, where is that cairn? I live near Raha before Oughterard and would like to go to see it. I read somewhere that there’s a cairn also nearer to Oughterard, maybe towards to Rossaveal, so not sure if this is a different one or is this in Knockacarna?